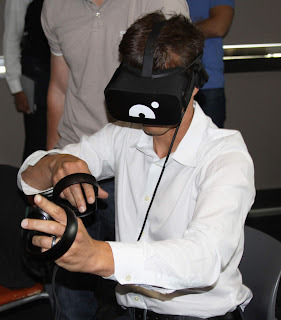 Nanome had demos of their VR tool at NanoDay. Nathan Tong, a fourth-year nanoengineering student at the UC San Diego Jacobs School of Engineering, was tired of getting the same question over and over again: what is nanoengineering? “I wanted to raise awareness about what the major is, what we do at UC San Diego, and also the potential future that could happen using nanoengineering,” Tong said. 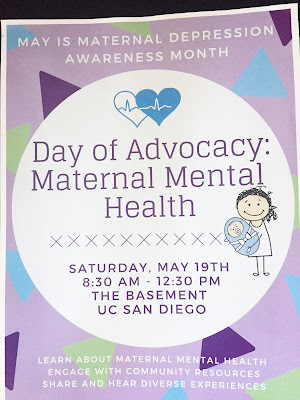 So he and the Nanoengineering and Technology Society (NETS) at UC San Diego resurrected NanoDay, a celebration of all things nanoengineering that hadn’t been held in at least the last four years. The student organization plans to make the event an annual occurrence to highlight all that’s going on in the department, and provide undergraduate students with tangible ideas of what a career in nanoengineering could look like. 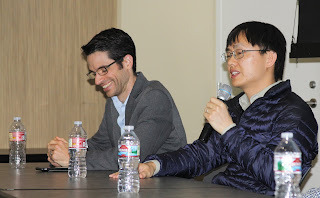 Professors Darren Lipomi and Sheng Xu shared their insight. UC San Diego was the first in the nation to create an official academic Department of Nanoengineering in 2007 and began offering it as an undergraduate degree program in fall 2010. In its simplest form, nanoengineering draws on all disciplines of engineering to create devices at the nano, or sub-micron, scale. It’s an interdisciplinary science relating biochemistry, engineering and physics to create structures smaller than bacteria with complex functions. As Darren Lipomi, a professor of nanoengineering and one of four professors on a panel about academic life in nanoegineering put it, nanoengineering principles underpin all of the concepts and phenomena we understand on a larger scale. 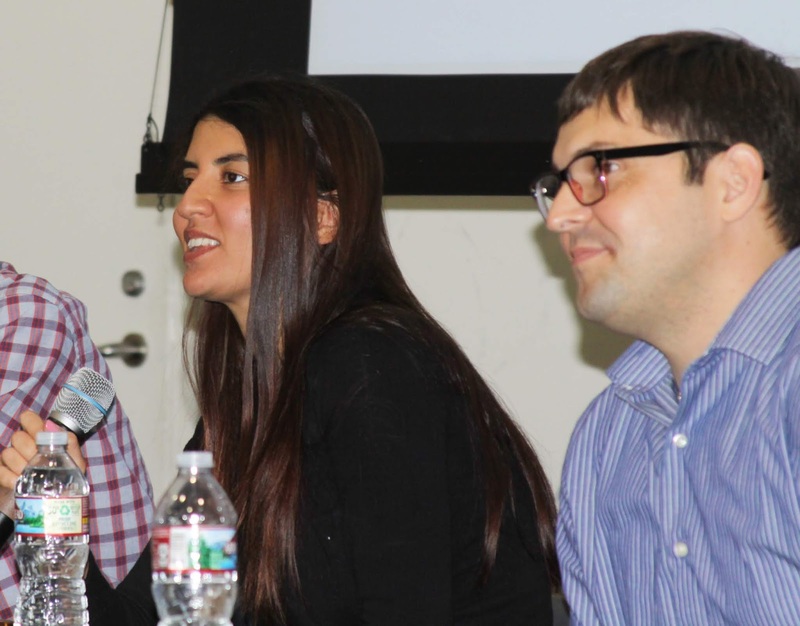 “I think the challenge is to identify something that’s not nanoengineering,” Lipomi said. questions about their career path and gave advice to students. 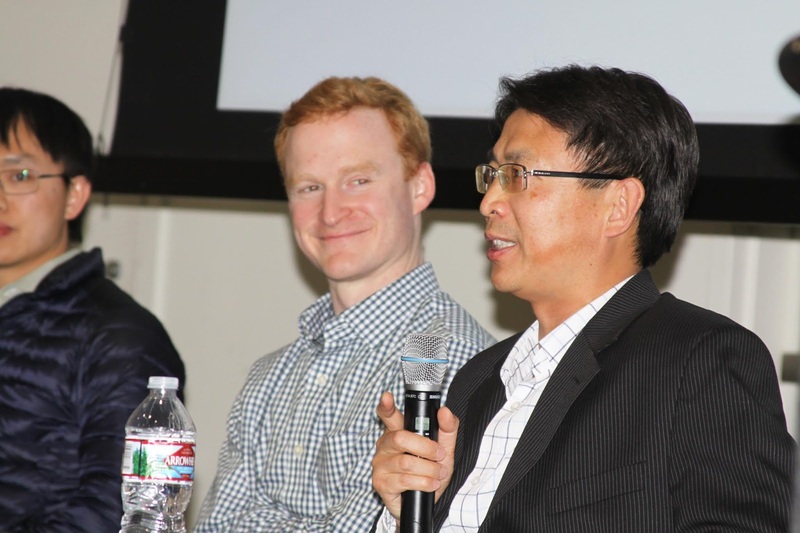 He was joined on the panel by nanoengineering professors Shaochen Chen, David Fenning and Sheng Xu. For a taste of post-grad life in industry, students heard from a panel of speakers from large companies like General Atomics, to small startups like GrollTex, and nanoparticle manufacturer nanoComposix, all of which have nanoengineering-specific positions. 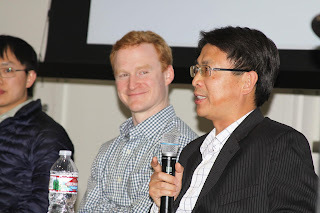 Joseph Wang, chair of the Department of Nanoengineering, gave opening remarks at NanoDay about the wide scope of research underway at UC San Diego—from needle-free tattoo-like glucose sensors, to micromotors for drug delivery, stretchable batteries and flexible ultrasound patches, it’s a diverse field. shared their perspectives on nanoengineering in industry. Nanoengineering alumnus Steve McCloskey, who founded virtual reality company Nanome, shared his post-grad story and advice with students. Nanome allows users to experience and manipulate atoms and molecules in a 3D environment, making it easier to visualize and design new medicines or chemicals, for example. The startup was one of seven companies honored with a Best of Show award at the Bio-IT World conference. First the EnVision Arts and Engineering Maker Studio doubled in size, and now it’s expanding its full time staff to better support students. 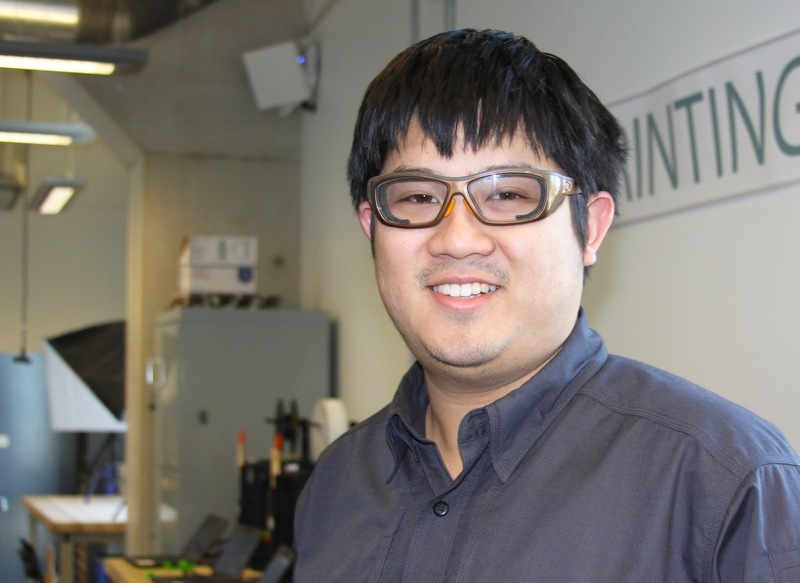 Undergraduate engineering and visual arts students using the space to build, tinker and design projects are in for a treat: Mark Liu joined the studio as the new lab manager in April. He’ll be providing students with support as they work on projects requiring tools like laser cutters, 3D printers, soldering irons and more. EnVision supports the Jacobs School of Engineering’s Experience Engineering Initiative to ensure all students have a hands-on or experiential engineering course or lab every year — starting freshman year. There are engineering and visual arts courses held in EnVision’s classroom space, and students are able to use the studio for class assignments or projects of their own on weekdays from 9 am to 8 pm. Liu will help students with questions about the tools available in the studio, provide input and guidance when requested, and serve as a resource to the more than 1,000 students who use the studio each quarter. Get to know Mark in this Q&A, edited for clarity. Q: You have a background in mechanical engineering. What drew you to that? ML: I always liked building stuff-- as a kid I played with Legos, built little robots, and have done FIRST robotics competitions for the last 10 years of my life as a student and then mentor. FIRST Robotics, which organizes youth robotics competitions around the world, is where I got experience running a lab, since I’m a mentor and run a FIRST team. I helped build the machine shop the team uses, and help the students use the tools. Q: Is that what you’ll be doing at EnVision? ML: I’ll be helping Jesse DeWald (EnVision Maker Studio Staff Director) with keeping everything running. In particular, I’ll be working with our students, staff and faculty to ensure that all of our classes have everything they need to be successful. Q: How many different tools and technologies can students use at EnVision? ML: We have 15 3D printers, laser cutters, CO2 laser cutters, a vacuum-former, and a printed circuit board oven. There are soldering irons, microscopes, a drill press, 10 computers with software for analysis and design including: CAD, MatLab, Adobe Suite and more. There’s also a lot of bench space so students will come in here to work on homework or projects and even hold meetings. It’s a great general workspace for both engineers and artists. Q: What do you like to do outside of the EnVision studio? ML: I’m into BattleBots and aerial photography with drones and quad copters. Two years ago Battle Bots was new to me but some friends had been doing it and I decided to join them. The team that I joined had been doing it for 15 years. Battle Bots are basically robots that can be remotely controlled and have weapons to fight other robots in big televised competitions. And way back when I was a freshman in high school I took a video film class as an elective for art since I can’t draw for my life. I took the video class because a few of my friends were in it, but I picked up photography editing and really liked it. So now I enjoy drones and aerial photography. That’s part of the reason why I think it’s cool that arts students can use EnVision as well. Q: What are you most excited to work on? ML: I’m excited to expand the space. Over the summer, we’re going to knock one wall down to push into the room next door so we can rearrange the studio portion. We’re also trying to establish a components store—a lot of students come in and need a resistor or capacitor, and now I have to say I’m sorry you have to go find that. So we’d like to start a store that has arduinos and resistors and small components for students. That’s a project we’re working on.